We told a story in March 2005 about Tommie Crowley's death about 1925, when he would have been around seventeen. His tragic death from appendicitis, owing to being miles from any possible medical care was talked about with hushed reverence for years in the family, as tragedies often are. Little Tommie, and later--before his death--a kid who was nearly a young man, must have been very important to the family. Until recently, I could only have imagined what he was like from the stories my father told, and my father was not much more than a toddler, himself, when Tommie died. I thought that there were no family photos of Tommie. Recently, however, we have unearthed this picture (see above) from 1913, which shows Mayme (Mary Patricia Crowley), her baby Neal, and little boy, Tommie, who was named after his Dad. While the picture is not of very good quality, a little bit of amateur photo enhancement with Adobe Photoshop makes it apparent that Tommie had his Dad's shock of curly hair and did seem to be a good looking kid. While accounts vary, some place the family on a homestead near Thunder Butte as early as 1908. If they were at Thunder Butte as early as this, they probably foundered, as many homesteader families did, when a dry year struck in 1911. That year saw many early homesteaders pick up and move back east. The Crowley's hung on, though. 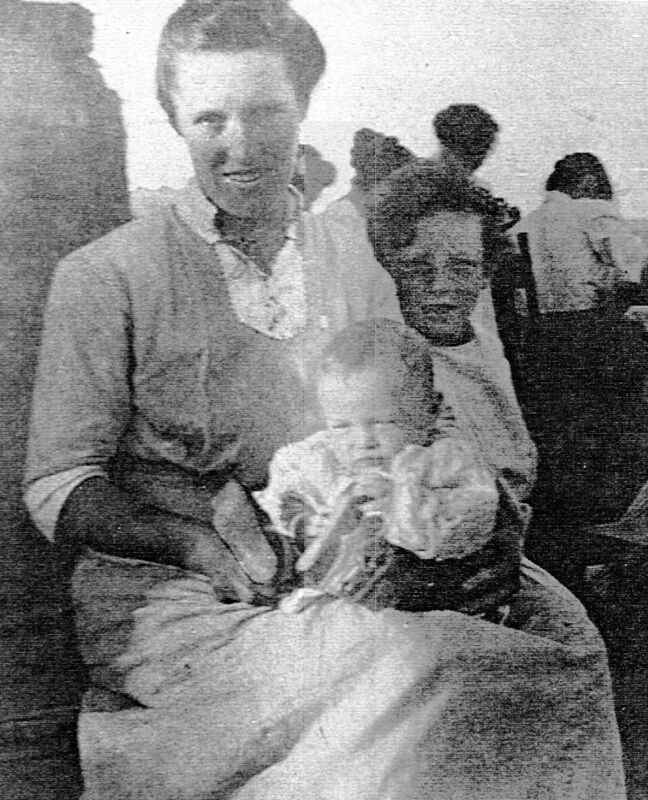 Thomas F. Crowley, little Tommie's dad, took title to 160 acres near Thunder Butte on October 30, 1913. In the picture, baby Neal looks to be five to seven months old. He was born in March, which would place the time at which the photo was taken at sometime during July to September of 1913. It is difficult to judge ages, though. Still, the way in which everyone in the photo is dressed suggests that the photo was taken before the Crowley's took title to their new homestead. By late October, it probably would have been getting quite chilly. South Dakota, west of the Missouri River, was ceded to the Lakota peoples following the Treaty of Fort Laramie in 1851. However, non-natives continued to trek through the region with regularity until gold was discovered in the Black Hills in the early 1870s. In fact, the Battle of the Little Big Horn at which Lt. Colonel George Custer and much of the Seventh Cavalry lost their lives was fought in 1876 by the Lakota under the leadership of Sitting Bull because of white incursions into the lands promised the Lakota by the Treaty of Fort Laramie. Though Custer and his men lost their lives, it was a turning point in the lives of the Lakota, who witnessed continued land takings and forced relocation to smaller, discontinuous reservations within their ancestral homelands. In 1876, shippers, prospectors, and homesteaders began traveling in wagon caravans across the rolling prairie landscape from the railroad terminus in Bismarck, North Dakota, to the growing center of gold mining and white settlement in the Black Hills—Deadwood, South Dakota. 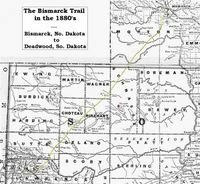 If one took a map and drew a straight line from Bismarck to Deadwood, they would know the approximate route of the trail. During its heyday, which lasted into the 1880s, the trail was the primary shipping point for goods and materials between Deadwood and places back east. It also was the primary stage line, with more or less permanent encampments growing up along the way to serve food, lodging, and provide provisions for the travelers. The trail was about 242 miles long, and in 1880 was divided between seventeen stations at which horses could be changed and provisions gotten. Even after the railroad finally came to Deadwood in 1886, the trail continued to be used by farmers, ranchers, and homesteaders as a way to travel to and from the population centers of the day. In 1975, the Butte County (South Dakota) Historical Society began a project of laying markers at various points along the old lay of the trail. In many places, the tracks that made up the former trail can still be seen today. The project and much of the history of the trail can be found in Vernon Holst’s, “A Study of the 1876 Bismarck to Deadwood Trail,” published in 1983 by the Butte County Historical Society. Unfortunately, the book is out of print and difficult to find today. The trail had an interesting history aside from the routine movement of wagon caravans and stages that occurred for a time along this stretch of open prairie. As with many frontier trails, there were occasional skirmishes with outlaws and Native Americans. There are even occasional tales of travelers who split off from the trail or wandered off during blizzard conditions, either never to be seen again or later found dead. Various versions of the massacre of one family of travelers—variously said to be the Wagnus, Waggoner, or Warner family—tell of an attack by Indians on July 17, 1877, near the site of today’s Highway 79, north of Bear Butte. Bodies were mutilated and possessions scattered across the prairie, according to the stories. Sometimes such stories were embellished to justify raising raiding parties to attack the Native Americans. No doubt, for a time, few whites or Native Americans who traveled near the trail in insufficient numbers lived to recount their adventures. In any case, the land traveled by whites was claimed by Native Americans as their own, and passage along the Bismarck trail probably further inflamed passions among both peoples. Interestingly, the trail passed within some twelve to fifteen miles of Thunder Butte. Perhaps the butte could have been seen from the trail. The trail probably served as one route of passage for early homesteaders in Thunder Butte country before the railroad came to Dupree and Faith early in the next century. 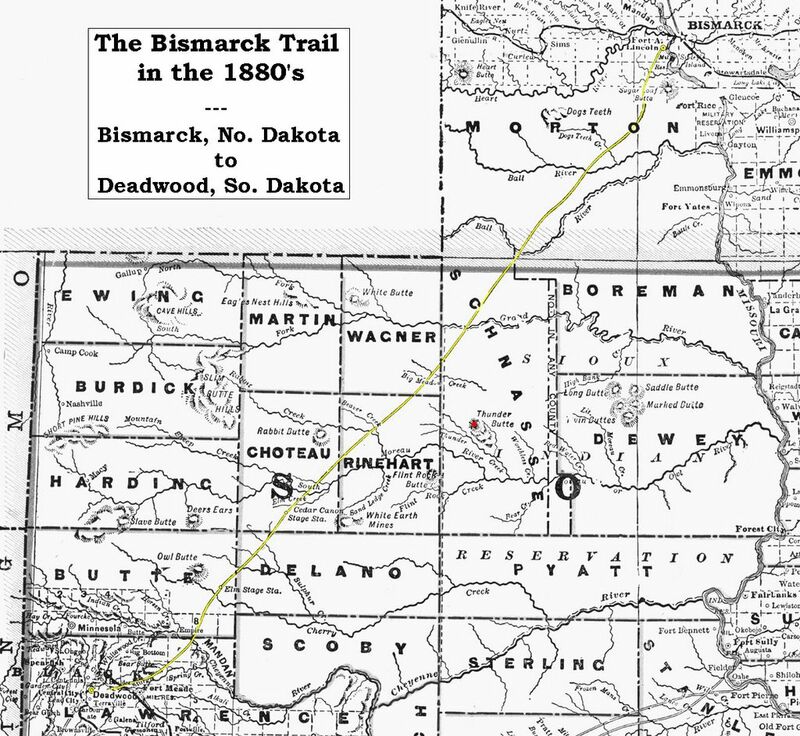 Thomas Crowley may have traveled part of this route when he moved his young family from Bismarck, North Dakota, to the vicinity of Thunder Butte in 1908. John Crowley notes: "There were many obstacles to overcome on the trail. The major obstacle was the Moreau River. There was only certain period of the year when it is passable at all; at other times they chose certain scarce, wide and flat locations where the river could be forded at its shallowest spot. The other obstacles were the cliffs and canyons. The nearer you get to the river the more steep and broken would be the terrain. Beyond the MOreau they would have to cross the Cheyenne river, Cherry creek and several other streams that were nearly bad as the Moreau." The tall tale was a staple of people who used to live on the prairie. Telling whoppers may have been a way to entertain on those dark and cold nights far from the nearest town and well before the invention or popularization of television, VCRs, DVD players, Tivo, and the internet. In any case, I will admit that I have had some doubts about certain dramatic details of some of the stories passed down to me, or which my father has told through this site. And, I did wonder about some of my father's musical adventures and his band, "Crowley's Rhythm Rascals." As a fitting climax for the Homecoming celebration, students will dance to the symphonic synchronization of the jazzin' jumpin' jives, Gene Crowley and his Rhythm Rascals, tonight at the American Legion Hall. The same issue of The Lemmon Squeezer contains another article about a "Cotton Club Cafe" show to be held the very same night by the Lemmon High School juniors and seniors. According to the article, my father also played the drums for that performance.